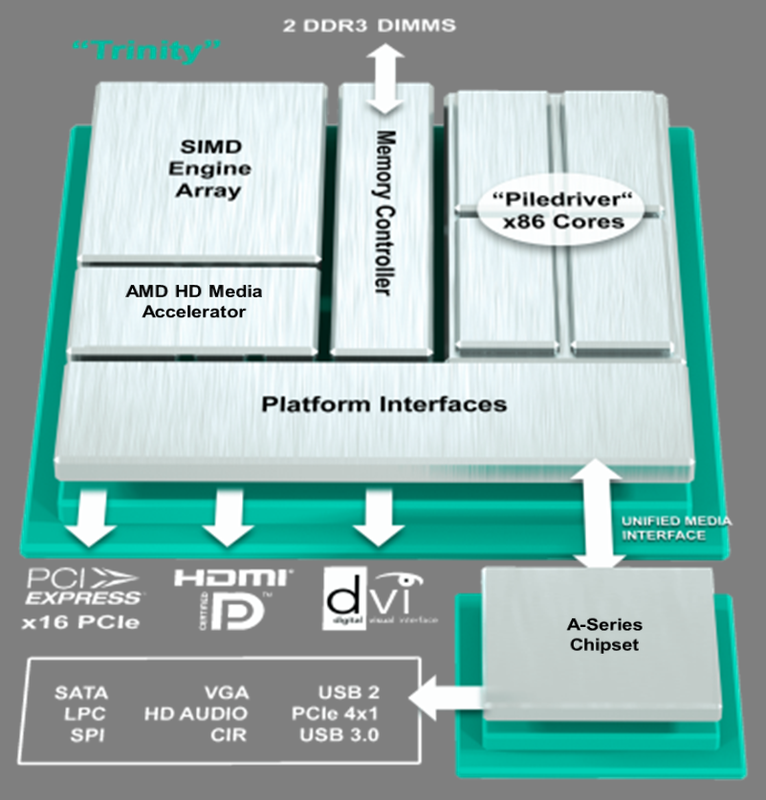 The AMD A4-5300 is a low-end desktop APU based on the Trinity architecture. The chip is produced ​​in a 32nm process and integrates 1 module with 2 CPU cores clocked at 3.4 up to 3.6 GHz. Furthermore, the 5600K has an integrated Radeon HD 7480D graphics unit and a DDR3-1600 memory controller. The CPU cores are based on a reworked Bulldozer architecture called Piledriver. Although marketed as a dual-core processor, the A4-5300 includes two integer cores and only one floating point unit in total. As a result, the CPU is not a true dual-core processor. Depending on the benchmark, the CPU performance of the A4-5300 can be somewhat below the desktop dual-core Celeron G550. Only while using specific instruction set extensions such as AES - which is disabled for many low-end Intel CPUs - can the AMD chip achieve better performance. Despite the low computing power, simple everyday tasks such as office programs, multimedia applications or Internet surfing are possible without major restrictions. However, extensive multitasking is severely limited. The integrated DirectX 11-compatible Radeon HD 7480D offers only 128 shader cores (7660D: 384) and clocks at 724 MHz with no Turbo. On average, the performance of the HD 7480D GPU is somewhere beween the HD Graphics 4000 and HD Graphics 2500 as found on Intel’s Ivy Bridge platform. The power consumption of the entire desktop APU is rated at 65 Watts.